University of Oklahoma head football coach Bob Stoops announced Tuesday that he has promoted offensive line coach Bill Bedenbaugh and defensive backs coach Kerry Cooks to assistant coordinator positions. Bedenbaugh (pronounced BEE-den-bo) is now assistant offensive coordinator and offensive line coach, while Cooks is now assistant defensive coordinator and defensive backs coach. Stoops said the title changes will not affect the Sooners' play-calling responsibilities of associate head coach and defensive coordinator Mike Stoops and offensive coordinator Lincoln Riley. "Bill and Kerry have done an excellent job helping develop our offense and defense," said Stoops, who is beginning his 18th season as OU head coach and who has won nine Big 12 championships. "I wanted to recognize their significant contributions and help facilitate their advancement in this profession. They are deserving." Bedenbaugh, who is starting his fourth year at Oklahoma, led a 2015 OU offensive line unit that featured All-Big 12 First Team honorees Ty Darlington and Nila Kasitati as the Sooners ranked No. 4 nationally in scoring, No. 17 in passing and No. 22 in rushing. OU started a pair of freshmen at the tackle positions, including left tackle Orlando Brown, who was named a Freshman All-American by the Sporting News. Three OU offensive linemen (Daryl Williams, Adam Shead and Tyrus Thompson) attended the 2015 NFL Scouting Combine, a total topped by only two other FBS programs. Williams was an All-Big 12 First Team pick, while Shead and Thompson were both second-team selections, and Williams and Thompson were both NFL Draft picks. 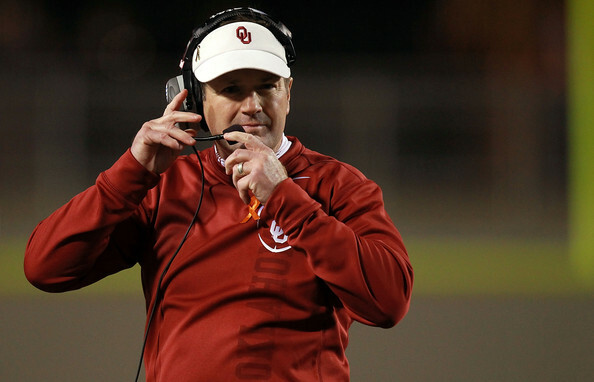 OU has registered its top two rushing seasons under Stoops since Bedenbaugh joined the staff. The Sooners led the Big 12 and ranked 10th in the nation in 2014, averaging 261.2 rushing yards per game, the highest total produced by the Sooners under Stoops. OU also led the nation that season by allowing just 9.0 sacks. Despite a host of injuries that shuffled the lineup, OU's offensive front displayed physicality and tenacity all season in 2013 under Bedenbaugh, helping pave the way for a rushing attack that averaged 223.9 yards per contest, the second-highest figures under Stoops. Now in his second year at Oklahoma, Cooks' 2015 defensive backs helped the Sooners limit opponents to just 202.8 passing yards per game, fewest in the Big 12. The opportunistic unit was responsible for 17 of OU's 20 interceptions in 2015, a number that ranked second in the conference and eighth in the country. Individually, cornerback Zack Sanchez was a semifinalist for the 2015 Thorpe Award and was named a second-team All-American by Sporting News, USA Today and the Walter Camp Foundation. Sanchez led the Big 12 and was second nationally with 0.6 interceptions per game. Cornerback Jordan Thomas and safety Ahmad Thomas were each All-Big 12 Second Team honorees. OU received 24 of 26 first-place votes in last week’s Big 12 preseason media poll and is the preseason favorite to win the 2016 Big 12 title. The Sooners open the season Sept. 3 against Houston in the AdvoCare Texas Kickoff at NRG Stadium in Houston.